In the previous tutorial you displayed related data. In this tutorial you'll update related data. For most relationships, this can be done by updating either foreign key fields or navigation properties. For many-to-many relationships, the Entity Framework doesn't expose the join table directly, so you add and remove entities to and from the appropriate navigation properties. The following illustrations show some of the pages that you'll work with. When a new course entity is created, it must have a relationship to an existing department. To facilitate this, the scaffolded code includes controller methods and Create and Edit views that include a drop-down list for selecting the department. The drop-down list sets the Course.DepartmentID foreign key property, and that's all the Entity Framework needs in order to load the Department navigation property with the appropriate Department entity. You'll use the scaffolded code, but change it slightly to add error handling and sort the drop-down list. The PopulateDepartmentsDropDownList method gets a list of all departments sorted by name, creates a SelectList collection for a drop-down list, and passes the collection to the view in a ViewBag property. The method accepts the optional selectedDepartment parameter that allows the calling code to specify the item that will be selected when the drop-down list is rendered. The view will pass the name DepartmentID to the DropDownList helper, and the helper then knows to look in the ViewBag object for a SelectList named DepartmentID. This code ensures that when the page is redisplayed to show the error message, whatever department was selected stays selected. The Course views are already scaffolded with drop-down lists for the department field, but you don't want the DepartmentID caption for this field, so make the following highlighted change to the Views\Course\Create.cshtml file to change the caption. Make the same change in Views\Course\Edit.cshtml. Normally the scaffolder doesn't scaffold a primary key because the key value is generated by the database and can't be changed and isn't a meaningful value to be displayed to users. For Course entities the scaffolder does include an text box for the CourseID field because it understands that the DatabaseGeneratedOption.None attribute means the user should be able enter the primary key value. But it doesn't understand that because the number is meaningful you want to see it in the other views, so you need to add it manually. In Views\Course\Edit.cshtml, add a course number field before the Title field. Because it's the primary key, it's displayed, but it can't be changed. There's already a hidden field (Html.HiddenFor helper) for the course number in the Edit view. Adding an Html.LabelFor helper doesn't eliminate the need for the hidden field because it doesn't cause the course number to be included in the posted data when the user clicks Save on the Edit page. 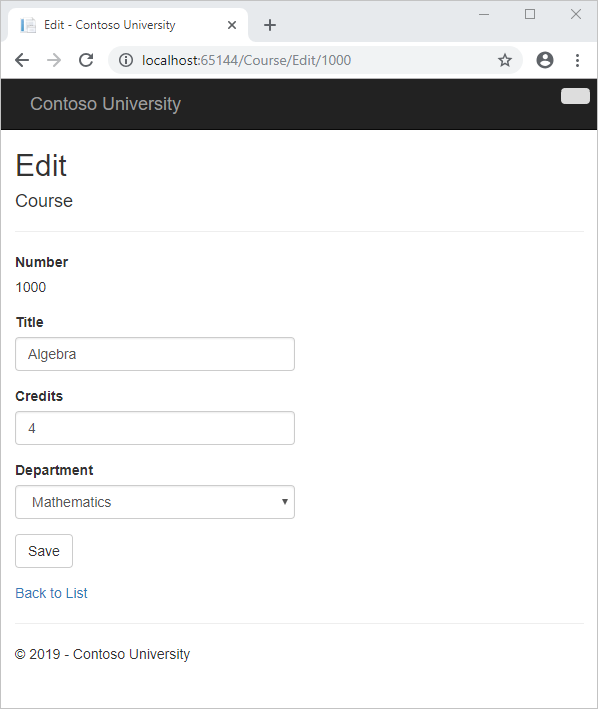 In Views\Course\Delete.cshtml and Views\Course\Details.cshtml, change the department name caption from "Name" to "Department" and add a course number field before the Title field. Click Create. The Course Index page is displayed with the new course added to the list. The department name in the Index page list comes from the navigation property, showing that the relationship was established correctly. Run the Edit page (display the Course Index page and click Edit on a course). Change data on the page and click Save. The Course Index page is displayed with the updated course data. If the user clears the office assignment and it originally had a value, you must remove and delete the OfficeAssignment entity. If the user enters an office assignment value and it originally was empty, you must create a new OfficeAssignment entity. If the user changes the value of an office assignment, you must change the value in an existing OfficeAssignment entity. This code drops the ViewBag statement and adds eager loading for the associated OfficeAssignment entity. You can't perform eager loading with the Find method, so the Where and Single methods are used instead to select the instructor. Changes the method name to EditPost because the signature is now the same as the HttpGet method (the ActionName attribute specifies that the /Edit/ URL is still used). Gets the current Instructor entity from the database using eager loading for the OfficeAssignment navigation property. This is the same as what you did in the HttpGet Edit method. Updates the retrieved Instructor entity with values from the model binder. The TryUpdateModel overload used enables you to whitelist the properties you want to include. This prevents over-posting, as explained in the second tutorial. If the office location is blank, sets the Instructor.OfficeAssignment property to null so that the related row in the OfficeAssignment table will be deleted. Saves the changes to the database. Run the page (select the Instructors tab and then click Edit on an instructor). Change the Office Location and click Save. Instructors may teach any number of courses. Now you'll enhance the Instructor Edit page by adding the ability to change course assignments using a group of check boxes. The relationship between the Course and Instructor entities is many-to-many, which means you do not have direct access to the foreign key properties which are in the join table. Instead, you add and remove entities to and from the Instructor.Courses navigation property. The UI that enables you to change which courses an instructor is assigned to is a group of check boxes. A check box for every course in the database is displayed, and the ones that the instructor is currently assigned to are selected. 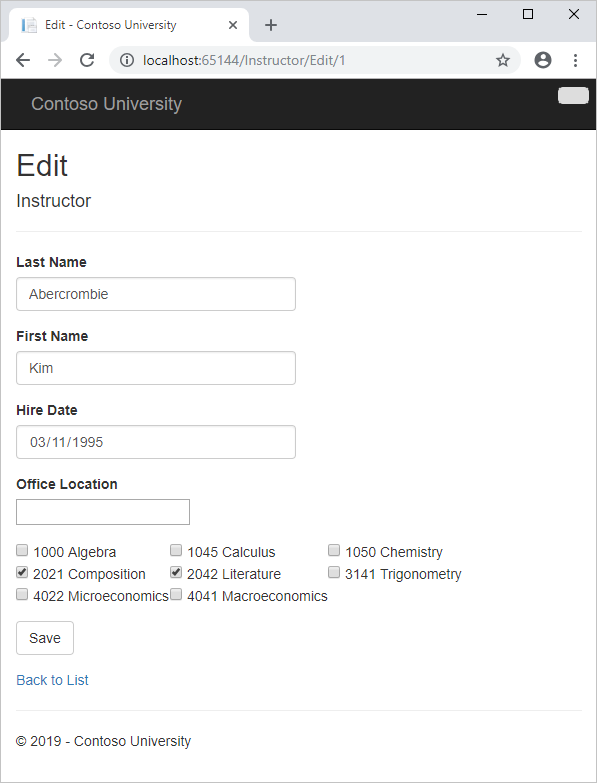 The user can select or clear check boxes to change course assignments. If the number of courses were much greater, you would probably want to use a different method of presenting the data in the view, but you'd use the same method of manipulating navigation properties in order to create or delete relationships. In InstructorController.cs, replace the HttpGet Edit method with the following code. The changes are highlighted. The code adds eager loading for the Courses navigation property and calls the new PopulateAssignedCourseData method to provide information for the check box array using the AssignedCourseData view model class. The code in the PopulateAssignedCourseData method reads through all Course entities in order to load a list of courses using the view model class. For each course, the code checks whether the course exists in the instructor's Courses navigation property. To create efficient lookup when checking whether a course is assigned to the instructor, the courses assigned to the instructor are put into a HashSet collection. The Assigned property is set to true for courses the instructor is assigned. The view will use this property to determine which check boxes must be displayed as selected. Finally, the list is passed to the view in a ViewBag property. Next, add the code that's executed when the user clicks Save. Replace the EditPost method with the following code, which calls a new method that updates the Courses navigation property of the Instructor entity. The changes are highlighted. The method signature is now different from the HttpGet Edit method, so the method name changes from EditPost back to Edit. Since the view doesn't have a collection of Course entities, the model binder can't automatically update the Courses navigation property. Instead of using the model binder to update the Courses navigation property, you'll do that in the new UpdateInstructorCourses method. Therefore you need to exclude the Courses property from model binding. This doesn't require any change to the code that calls TryUpdateModel because you're using the whitelisting overload and Courses isn't in the include list. The code then loops through all courses in the database and checks each course against the ones currently assigned to the instructor versus the ones that were selected in the view. To facilitate efficient lookups, the latter two collections are stored in HashSet objects. If the check box for a course was selected but the course isn't in the Instructor.Courses navigation property, the course is added to the collection in the navigation property. If the check box for a course wasn't selected, but the course is in the Instructor.Courses navigation property, the course is removed from the navigation property. After you paste the code, if line breaks and indentation don't look like they do here, manually fix everything so that it looks like what you see here. The indentation doesn't have to be perfect, but the @</tr><tr>, @:<td>, @:</td>, and @</tr> lines must each be on a single line as shown or you'll get a runtime error. This code creates an HTML table that has three columns. In each column is a check box followed by a caption that consists of the course number and title. The check boxes all have the same name ("selectedCourses"), which informs the model binder that they are to be treated as a group. The value attribute of each check box is set to the value of CourseID. When the page is posted, the model binder passes an array to the controller that consists of the CourseID values for only the check boxes which are selected. When the check boxes are initially rendered, those that are for courses assigned to the instructor have checked attributes, which selects them (displays them checked). After changing course assignments, you'll want to be able to verify the changes when the site returns to the Index page. Therefore, you need to add a column to the table in that page. In this case you don't need to use the ViewBag object, because the information you want to display is already in the Courses navigation property of the Instructor entity that you're passing to the page as the model. Run the Instructor Index page to see the courses assigned to each instructor. Click Edit on an instructor to see the Edit page. Change some course assignments and click Save. The changes you make are reflected on the Index page. Note: The approach taken here to edit instructor course data works well when there is a limited number of courses. For collections that are much larger, a different UI and a different updating method would be required. In InstructorController.cs, delete the DeleteConfirmed method and insert the following code in its place. If the instructor is assigned as administrator of any department, removes the instructor assignment from that department. Without this code, you would get a referential integrity error if you tried to delete an instructor who was assigned as administrator for a department. This code doesn't handle the scenario of one instructor assigned as administrator for multiple departments. In the last tutorial you'll add code that prevents that scenario from happening. This code is similar to what you saw for the Edit methods except that initially no courses are selected. The HttpGet Create method calls the PopulateAssignedCourseData method not because there might be courses selected but in order to provide an empty collection for the foreach loop in the view (otherwise the view code would throw a null reference exception). The HttpPost Create method adds each selected course to the Courses navigation property before the template code that checks for validation errors and adds the new instructor to the database. Courses are added even if there are model errors so that when there are model errors (for an example, the user keyed an invalid date) so that when the page is redisplayed with an error message, any course selections that were made are automatically restored. If you modify the Courses property in this way, you can remove the explicit property initialization code in the controller. 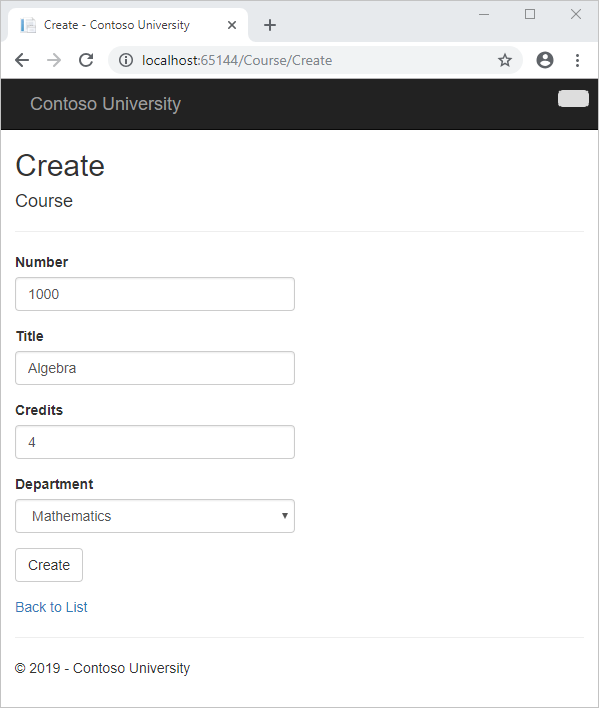 In Views\Instructor\Create.cshtml, add an office location text box and course check boxes after the hire date field and before the Submit button. After you paste the code, fix line breaks and indentation as you did earlier for the Edit page. Run the Create page and add an instructor. As explained in the Basic CRUD Functionality tutorial, by default the Entity Framework implicitly implements transactions. For scenarios where you need more control -- for example, if you want to include operations done outside of Entity Framework in a transaction -- see Working with Transactions on MSDN. Advance to the next article to learn how to implement an asynchronous programming model.